Jeannine Roberts Royce: HOW BOLD WOULD YOU BE? HOW BOLD WOULD YOU BE? 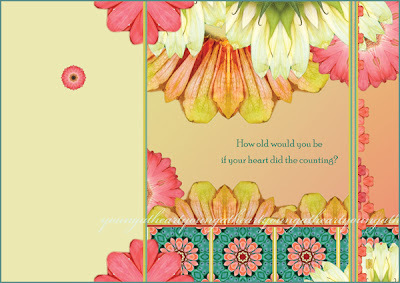 Above is a new illustration that was recently licensed to Calypso Cards as a birthday card. Release date was January of this year. It is one of five new styles added to my group at Calypso. This view is the flat layout of the card before all the text is printed on the back. I wondered: When are you ever too old to try something you're intrigued with? No matter how the years advance, my heart feels as spirited and curious and willing as ever, maybe more so. It's what a life in full bloom is all about. On my Fearless blog, I wrote about an epiphany I had while in Bali many years ago. You can read about it here. The short version is something like this: I don't want to look back on my life and see I've missed trying something for lack of courage, or because I thought it was too late, or I was too old. How old would you be if your heart did the counting? It's never too late. Always be young at heart.